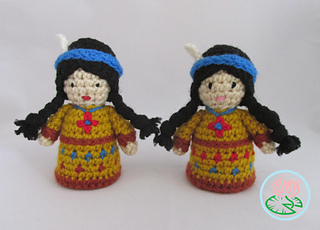 A PDF pattern for a mini Amigurumi Native American/Indian Doll. Basic knowledge of crochet is required (US terms), at least how to make a single crochet stitch, increase in the same stitch and half double crochet. 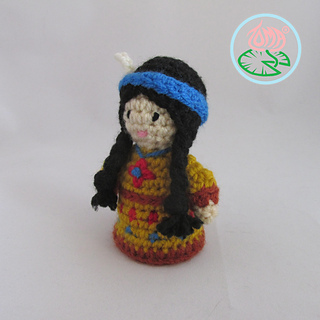 APPROXIMATE SIZE: 10 cm (4 in) but can be changed depending on the yarn and complementary hook to be used. If you are planning to use a different yarn brand or type, use a hook size at least 0.5mm less than suggested on the yarn label to create tight stitches. 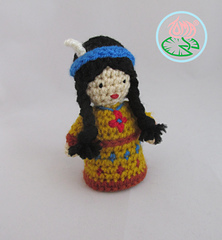 Instructions are applicable to all hook sizes and almost to all acrylic and cotton yarns. 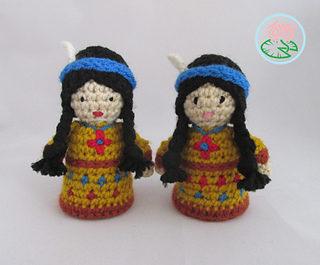 Instructions are written in English and expressed in US crochet terms. By purchasing any 4 of my patterns you will automatically get the fourth one for free. Simply add 4 or more patterns to your shopping basket and the least expensive pattern will be, automatically, chosen as a free pattern; for eight patterns the two least expensive becomes free and this goes on. Please note ‘Combos’ are not eligible for this offer as they are already offered at a discount. You may not copy, resell, translate, post on the internet or redistribute (fully or partially) this pattern. Mass production and Internet sales of finished items based on this pattern are not allowed. If you are interested in doing so please contact me.